I just recently stumbled across this and thought it was pretty cool. Rick Lyke of lyke2drink compiled all the data about the medals that have been awarded at the GABF since 1987 and created this map and charts. 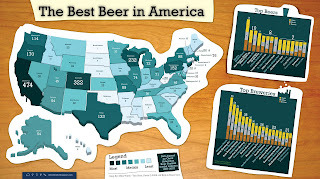 It shows medals won by state and also breaks it down into Top Beers and Top Breweries. It looks like every state has had a winning entry except for West Virginia. According to the Beer Me website, it does appear to have at least four active breweries, so it still has a chance. Its interesting to see that Texas has actually done pretty good over the years. We'll see how many more medals we can add to that with all the new breweries and brewpubs that have opened over the past few years. I didn't have time to post anything over the long weekend as I was too busy doing absolutely nothing... and it was everything that I thought it could be! Actually, I did do a few things, but it was a pretty low key weekend. Liberty Ale from Anchor Brewing seemed appropriate to drink on Memorial Day. I hadn't actually had one in quite a while and I forgot how much I enjoy them. Sierra Nevada's Southern Hemisphere Harvest Ale just sounded fun and tasty when I saw it on the shelf at the local Spec's. The hops are picked in New Zealand, packaged and whisked directly to Chico, CA to brew this beer. I based my American Mild on Pride & Joy from Three Floyds since its an American version of a British Mild which is exactly the style of beer I was looking for. I still don't have any Pride & Joy to compare it to (Cory? Jeff?) but my attempt at brewing a session beer turned out pretty good if I do say so myself. I was little concerned about the flavour when I was bottling as the bitter grapefruit flavour was much stronger and more prevalent then I thought it would be. However, after over a month in the bottle, it has smoothed right out. There is still a grapefruit flavour with a slight bitterness up front, but it's soft and fades out in the finish. Its not harsh or biting as I worried it would be. Its got a great mouthfeel with head retention all the way to the bottom of the glass. Its hard not to drink this beer quickly, but you can if you want to since the ABV is only 4.2%. The aroma is a little light though and I'd like to get that cranked up a notch in the next batch. Regardless of how it ends up comparing to Pride & Joy, its pretty much what I was looking for in a session beer. With some very minor tweaking, this could become my house beer. This was one of the beers I got cheap in the mixed sixpack from HEB and I'm glad I hadn't spent $9.50 for a 4-pack of it. The colour was darker then I would have expected for the style, but the aroma was citrusy and spicy. However, the flavour was overwhelmingly sweet and malty with an almost oily mouthfeel. The higher alcohol was noticeable in the finish which also had an odd taste that made me think of a Cesar (a Canadian cocktail made with Vodka and Mott's Clamato juice), which is not good since I don't particularly like Cesars. Not at all what I was expecting when I took my first drink. I've never been so disappointed by a Sam Adams beer. Oh well, it wouldn't have been anything purchased often anyway. This week has been designated as American Craft Beer Week by the Brewers Association as a way to support and celebrate the small independent craft breweries in America. Stephen Colbert even mentioned it on his Colbert Report (although he then drank a Pabst Blue Ribbon). Click on the logo to the left to go to the official website for more information and a list of special brewery events around the country. While grocery shopping at our local HEB, I noticed the end shelf of the beer and wine section was now filled with single 12oz bottles of various craft and micro brews with a stack of empty HEB sixpack carriers nearby. Basically, you can now create your own mixed sixpack for $1.49 per bottle ($8.94 per sixpack) of whatever singles you cram in the sixpack carrier. Its not necessarily a good deal, depending on what beers you choose, but it does allow you sample different beers without having to purchase an entire sixpack of it. These create-your-own sixpack displays are certainly nothing new, but what made this display more interesting was the beer I found on the shelf. I was quite surprised to see single bottles of the Samuel Adams Imperial White and Imperial Stout since they're only sold in four-packs at around $9.50 (or more). Assuming these beers were probably on the shelf by mistake, I quietly slipped a bottle of each into a carrier as well as a few other beers that I'd been mildly interested in trying and headed for the checkout. I'll definitely need to keep an eye on their selection of singles in the future. In 1988, May 7th was announced before Congress as National Homebrew Day. The American Homebrewers Association (AHA) created Big Brew as an annual event to be held on the first Saturday in May to celebrate the National Homebrew Day. Homebrewers planning to participate are asked to register their locations for a communal brew-in. Then, on Big Brew day, everyone congregates at the brewing site, joins in on a collective toast at noon Central time and gets on with brewing one of the recipes selected by the AHA. Full information is available at the Big Brew website. I'm up in Canada visiting my parents, so I'm unable to participate this year, but I'll try and join in on the toast with a local craft beer. Cheers!